For those who've never visited Old Towne Orange, California, it's an odd place. As someone who grew up in a quaint mid-west town, it's familiar and comforting, but amidst the hustle and bustle of California freeways and endless expanses of asphalt and shopping centers, it feels out of place as if you've taken a step back in time. Tree-lined streets radiate off of the town circle with their green lawns and classic Californian craftsman bungalows, while visitors pace the downtown sidewalks, hopping in and out of the antique stores that have earned the town much of its prestige. Old wooden bureaus and unique silverware may be the main draw for tourists, but Orange also has a history steeped in decades of gasoline-fueled passion, and it continues today. Tucked away in corners you'll find old hot-rod shops and lowrider garages. Along the side alleys, you're bound to stumble upon a classic car just out of restoration, and if you're lucky, you'll notice a few unique shells waiting for their turn in the paint booth. The whole town has this wonderful atmosphere of decades passed, so when Paul Medhurst of Type2Detectives invited me out to spend a Saturday in the Old Towne, I was quick to accept. Paul and I have known each other for a few years now. 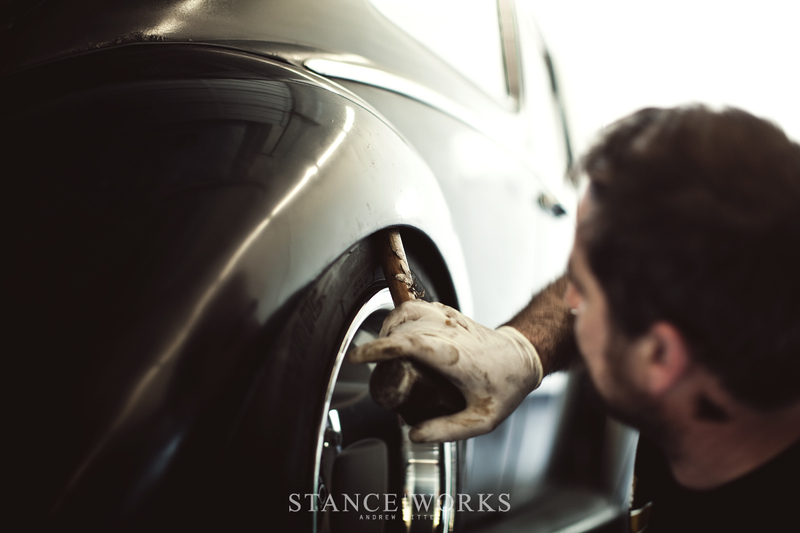 He's one of the madmen behind the Type2Detectives, a band of gents over in the UK that have been building, restoring, and slamming aircooled Volkswagens for years. There's a good chance that if you've seen pictures of a VW Bus pushing pebbles down the streets of Cambridge, you're already aware of their work. I certainly had, so when we began talking a few years back, we quickly bonded over a shared affinity for slammed vehicles. This past week marked another California visit for Paul in a search through the sunny land of aircooled beach cruisers for cars to bring back across the pond. With only a few days behind him, he had already collected a few aircooled examples from the the Porsche and Volkswagen marques, so he set his eyes on a lifelong project that he had always envisioned. That's when he called me. 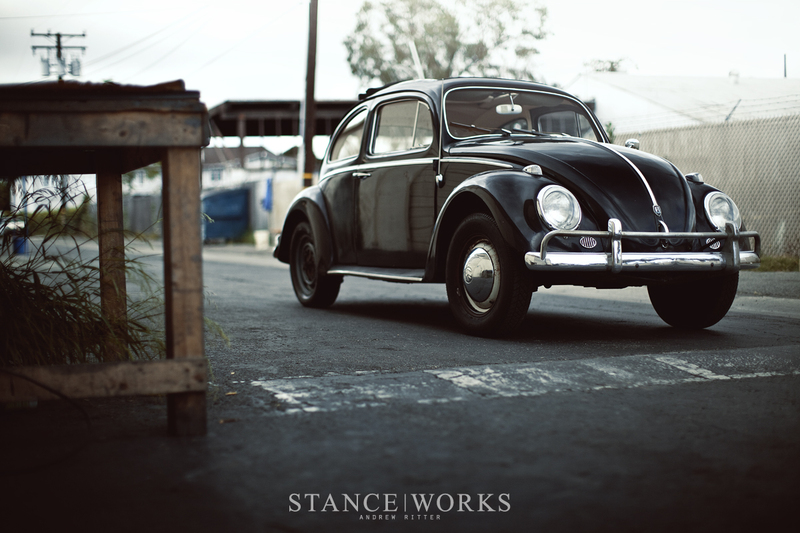 The project was a 1960 Sunroof Beetle that sat in the showroom of Collecting Them Classic Car Sales in Old Towne, Orange. 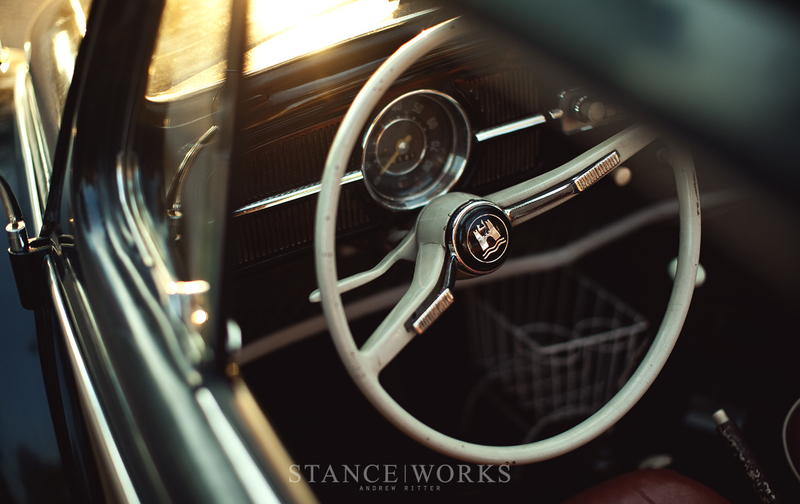 The car still wore the marks of the past 55 years with little nicks and dings around each corner, and paint that had worn away after constant use, but as a whole, it was perfect in my eyes. The slightly faded red and cream interior popped against the black paint of the german aircooled and its imperfections gave it an appealing demeanor. 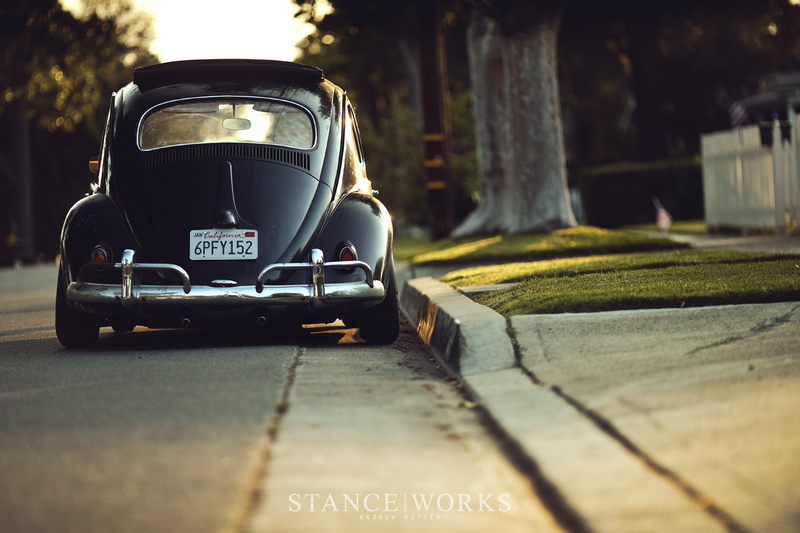 Paul lowered old aircooleds a countless number of times, but he has always longed for a chance to do it under the sunny skies of California where Volkswagen's classic cars have always seemed at home. We had tasked ourselves with quite a steep deadline, hoping to finish up the build before sundown so that we could photograph the results with the last of the remaining light. 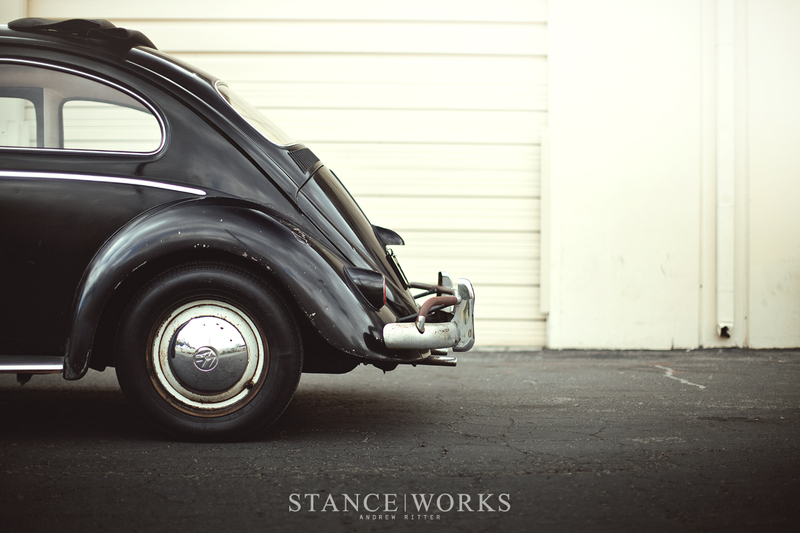 While I've always heard that lowering a beetle was easy, and the coming summer months allotted us some extra daylight, I was a bit skeptical of our chances when I walked in and saw the beetle at rest with its factory wheel gap and mismatched steelies. 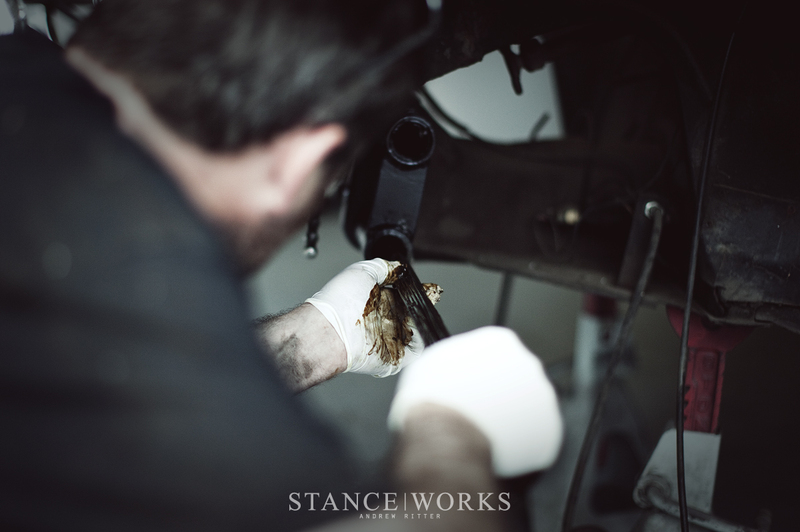 It seemed like a lot of work lay ahead, but every journey starts with a first step, so Paul got to work, stripping out the crusty members of the front beam suspension. It quickly became apparent that he's practiced this process to the point of craftsman-like familiarity. Pacing back and forth from driver's side to passenger side, he dismantled the front corners in unison. For a car that has been on this earth nearly twice as long as I, it put up surprisingly little fight. Not a single seized bolt or rusty nut called for the excessive force and breaker bars that often come out while working through decades of road grime. We counted our blessings as the old beam dropped from its roost with ease and Paul began to salvage the bits that we would need for the rebuild. Prior to leaving, Paul shipped over a Type2Detectives adjustable narrowed beam and a pair of drop spindles, which arrived shortly after his plane touched down. 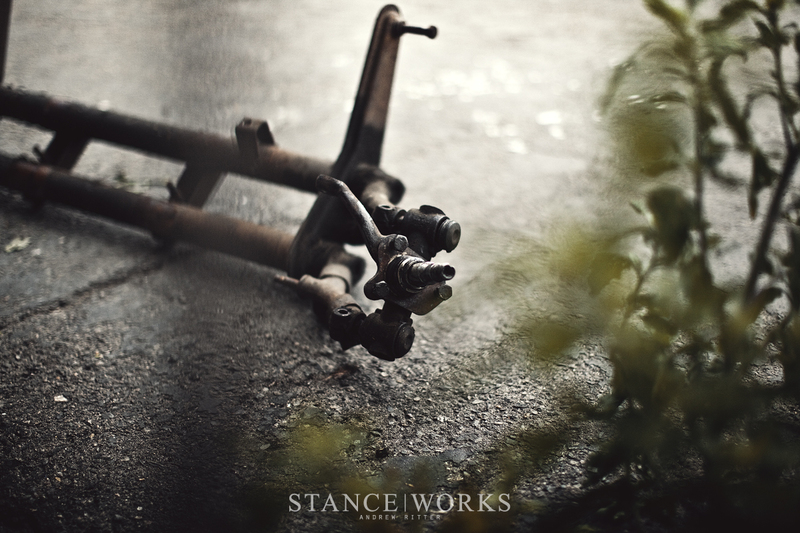 The drop spindles relocate the spindle in relation to the mounting points on the knuckle, thus lowering the car without altering the suspension geometry, and suspension travel and tie rod clearance remain unchanged. However, even with the drop spindles, we knew it wouldn't be quite enough for the ends that we had in mind. The T2D adjustable beam would be the final piece to the puzzle. Retaining only the original torsion arms, Paul rebuilt the front end around the narrowed beam. A set of rounded shims mounted between the frame and beam aided the driving experience with a little caster, and integrated adjusters would allow us to spin the suspension down to our liking. 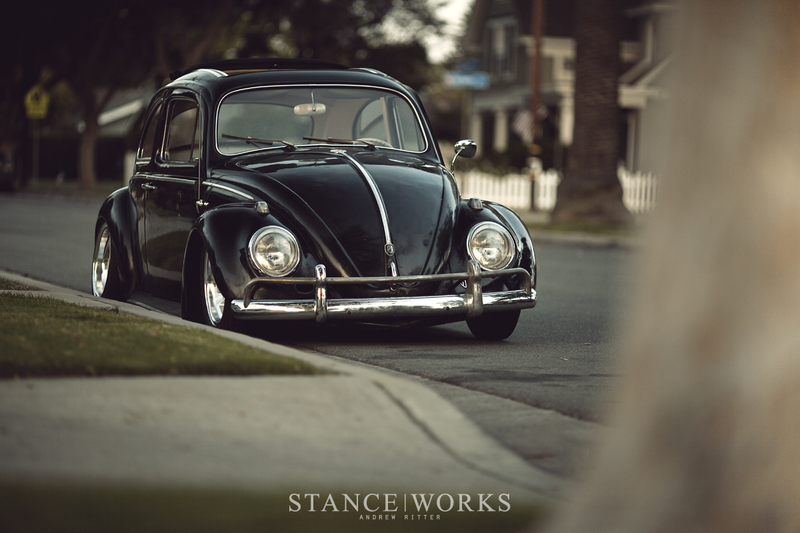 The Beetle and other aircooled vehicles in the VAG lineup are unique in that they utilize a torsion bar setup, gaining their spring rate from the torsion built up in twisting a pack of steel leaves. With an ample amount of grease applied to each, Paul threaded a pair of leaf packs through the beam before cutting them down to the narrowed track width. The old trailing arms from the original beam found their way back home under the fenders of the beetle, and we broke out a straight edge and calipers to determine the track width differential between the top and bottom arms. 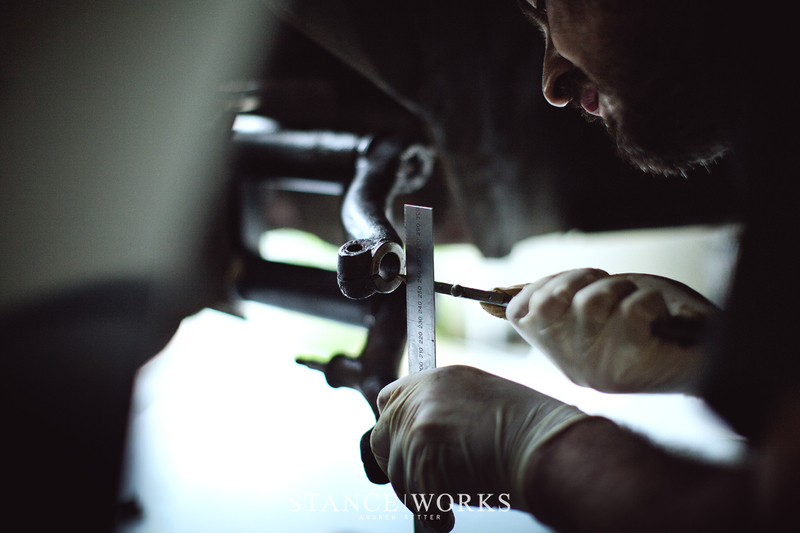 Armed with the measurements and a reference chart, Paul worked out the number of shims that would need to be used between the spindles and trailing arms. By utilizing different shim combinations on the top and bottom spindle mounts, the camber angle could be adjusted and evened out from side to side. With the spindles in place and the arms tightened down, a brand new set of tie rods replaced the fatigued rods and ball joints that came off earlier that morning. The front end was nearly complete and our stomachs were protesting in hunger, so we swept up the debris and put back the tools before walking down the block to the town square. We sat at Watson's Soda Foutain and sipped on milkshakes that Paul assured me often tempted him to travel back to the states based on their deliciousness alone. Paul was confident that the rear end would be even easier than the front. The rear hubs are suspended on a spring plate made of tensile steel to soak up some of the bumps, and the plate twists with the torsion bar, giving the rear its spring rate. 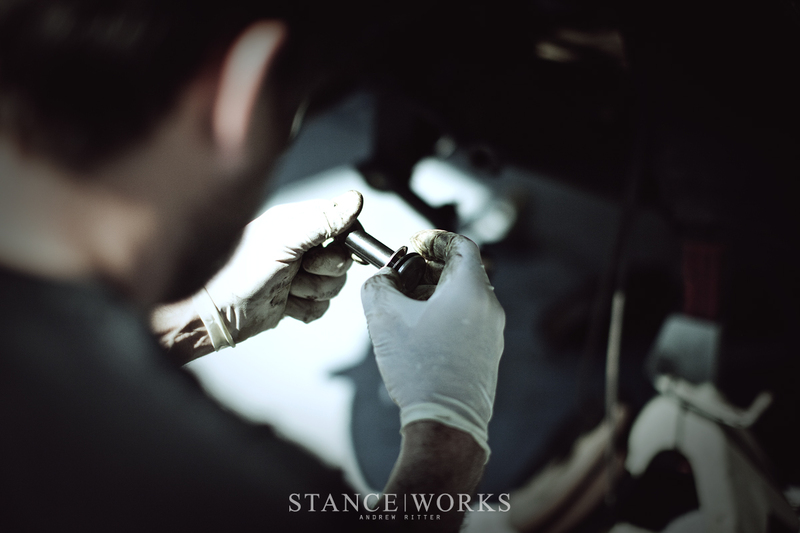 The ease of adjustment comes from the splines that locate the spring plate on the torsion bar. 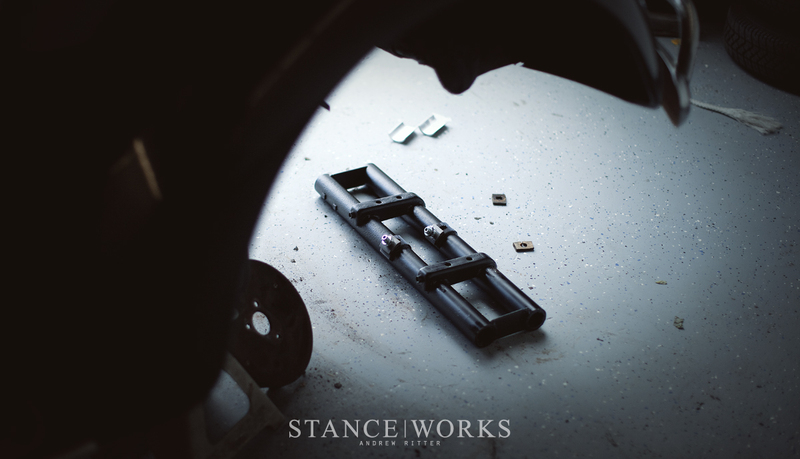 With 48 splines on the outer end of the torsion bar and 44 on the inside, there's a broad range of finite adjustments that can be made, but we knew that we wanted it on the ground. Re-indexing our rear by 2 splines, we lowered the backend by over 4 inches. In no time, we were buttoning up the rear suspension and test fitting the wheels. 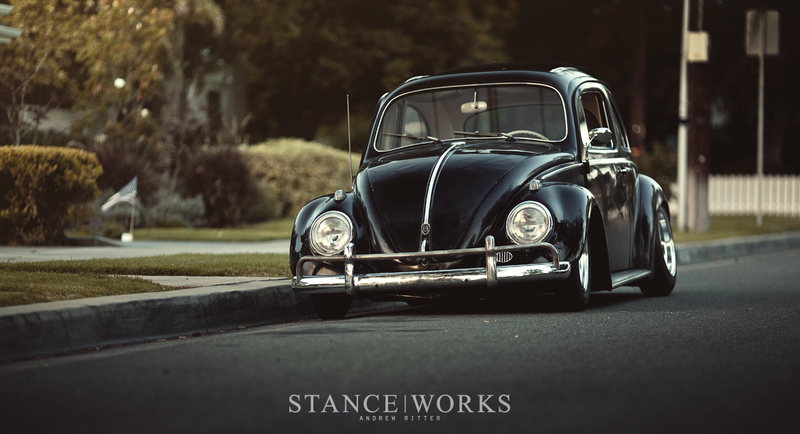 The natural camber from the swing axles that has given lowered aircooleds their iconic squat also helped to pull in the aggressive wheel and tire setup, requiring only a little additional persuasion to tuck into the wells. The cloud cover outside parted and gave way to a warm sunny afternoon. 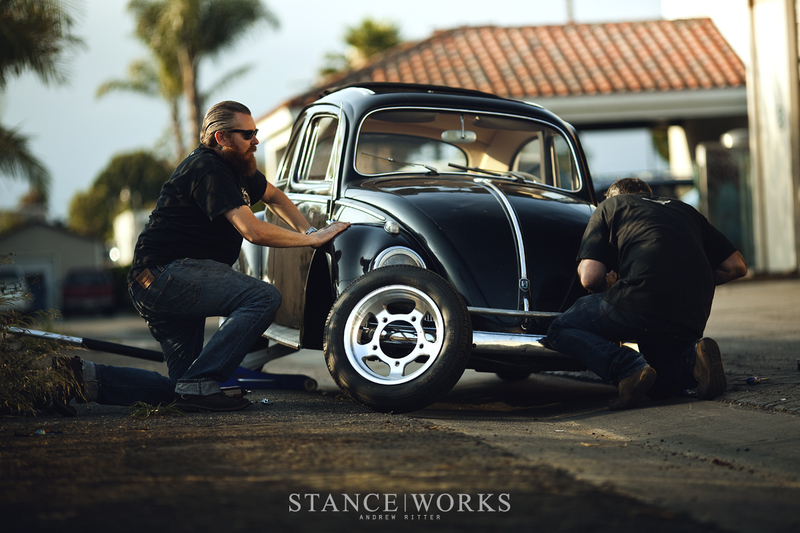 In a moment of glory, Paul lowered the jacks and allowed the Beetle to touch the ground for the first time since its makeover. We all looked on with grins and chuckled at the drastic change that had just taken place. The beetle was finally sitting as a proper T2D cruiser should. Before I could even snap another photo, Paul was starting it up and taking for its first cruise down the quiet streets. After a few test runs and some minor hammer-induced clearance adjustments were made to the front inner clearance, we were off. Paul was staying with his friend Chris Ashworth, a long time friend from home who now resides in Orange and owns the classic car collection, so we headed back home where we joined Chris to admire the day's accomplishments from the porch of his bungalow. As the golden California sun set on the front lawn, Paul and Chris exchanged stories over beers, talking of parties in camper vans and antics-filled trips behind the wheels of split-window buses. I can't think of many better ways to spend a simple Saturday than tinkering on an old car and reminiscing with fellow car enthusiasts. As I write this, Paul and his newly-lowered 1960 Beetle are heading back to the UK, but I look forward to his inevitable return to hunt down some more California classics and perhaps share a milkshake or two. Another pair of OG fenders ruined. Great way to promote the hobby. What gear do you and mike use the most? The quality of these shots are amazing! For the stills what are you using? Action shots? What are the SPECS on the wheels??? DA_Photo – Thank you for the kind words! 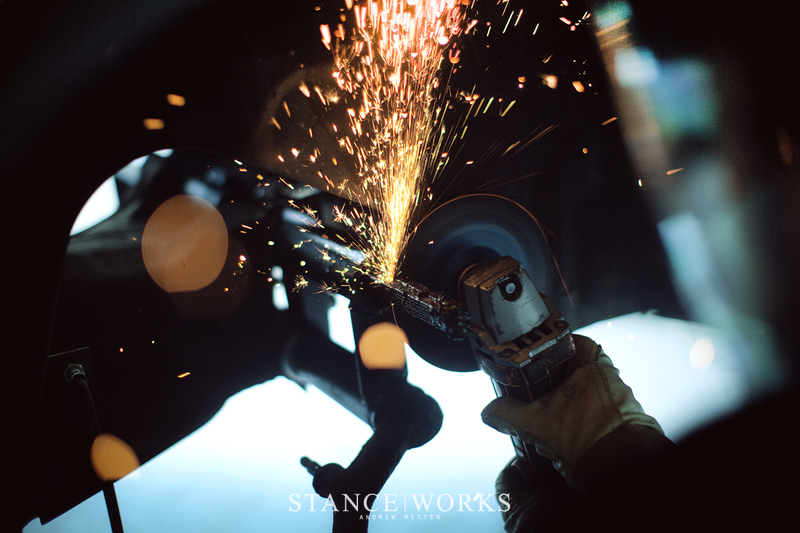 Mike and I use a pair of Canon 5D Mkiis for all of the images you see on StanceWorks, whether it’s motorsports or automotive stills. We switch between a few select lenses depending on the location and desired outcome. This shoot was shot primarily with my 50mm. MiguelAyako – They are 15×4 and 15×7 BTR Buggy Wheels. My original paint ’64 sunroof is 2.75″ off the ground, has staggered widened smoothies, and a built dual carb engine so I’m not against modifications. I just hate to see good German metal hacked because of a temporary trend. But I guess that’s the price to pay to be cool on the internet these days. My car has nothing done that can’t be reversed… I can put it back to 100% stock and matching numbers in a weekend. If you want to roll your fenders, fine. Go earn a few more likes on Instagram, at least until the next fad comes and you’ve gotta change your build again to keep up. I do appreciate modified cars. But there’s no reason to hack up an increasingly rare original car just to fit 1/2″ more wheel under the car. 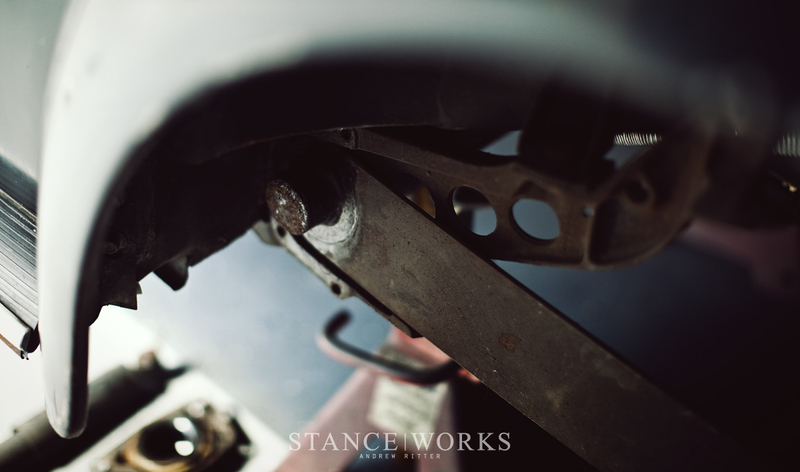 theastronaut – There was no hacking done to the fenders. Paul simply rolled the inner lip on the fender which does no harm to the car. You can try to dismiss others by applying your own misguided interpretation of their motives, but I hope you’ll consider that people simply enjoy their cars in their own different ways. There’s no right or wrong in this hobby as long as you have fun with your own car. 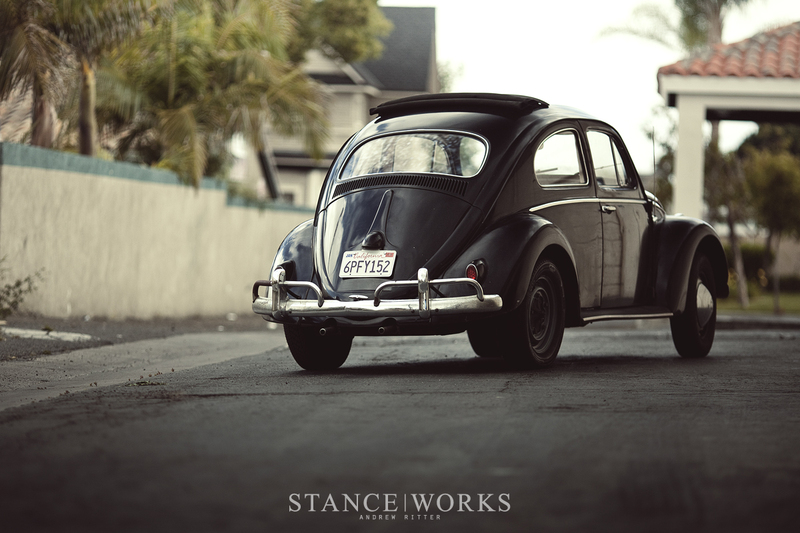 Fortunately, once we finished up this beetle and Paul drove it down the street, he was grinning ear to ear. That’s the real motivation behind builds…that feeling of joy. The rolled edge is the structure of the fender. It’s what gives the fender its strength. It’ll eventually fatigue and crack if the edge isn’t a full roll. It’s not a typical fender with another inner support panel; it’s just the shape of the fender that helps it support itself. I do metalwork, fabrication, and restoration so I see cracked fender edges on old cars often… usually in the same spot where a rolled edge was damaged/flattened for whatever reason. But, there’s nothing wrong with doing away with that if that’s what helps you enjoy your car. Have fun with your happy feelings while the fenders still are in one piece. theastronaut You know you can roll a fender without damaging the structure/strength of the particular part? Actually my Mk1 Caddy’s fender became a lot stronger after rolling them. You just have to do it properly.